Delbert “Shorty” Belton will be buried with full military honors today at noon at Greenwood Memorial Terrace in Spokane. Friday, the family will host a smaller, more intimate ceremony at North Hill Christian Church at 2 p.m. Both services will be open to the public. Bill Belton won’t see his father, Delbert “Shorty” Belton, laid to rest with full military honors this afternoon. He can’t. The cancer destroying his body has left him bedridden, unable to leave the house except for rare special occasions and frequent trips to the hospital. The last five years since his diagnosis have been a struggle for the Belton family. Bill Belton’s health continues to deteriorate, and about a dozen surgeries have taken them to U.S. Department of Veterans Affairs hospitals across the Pacific Northwest. Then there was the death of his father a week ago in what police have called a senseless beating by two teenagers. The suspects, Demetruis Glenn and Kenan Adams-Kinard, both 16, are behind bars on multimillion-dollar bonds on allegations of beating the World War II veteran to death after robbing him while he waited for a friend in his car outside the Eagles Lodge in north Spokane. Bill Belton’s wife, Bobbie Belton, said she was in shock when she first received the call that her father-in-law was dying. They didn’t go to the hospital to see him but received multiple calls throughout the night from doctors. The next day, she delivered the news to her husband at the Mann-Grandstaff VA Medical Center, where he’d been fighting an infection since Aug. 15. Bill Belton, a Navy veteran who served in the Vietnam War, went home for the first time Wednesday. Shorty struggled to see his son sick and didn’t visit often, Bobbie Belton said. He’d ask if Bill was going to get better, but the cancer had taken its toll, leaving him paralyzed from the waist down and with limited mobility in his arms. “He didn’t like seeing Bill like this,” Bobbie Belton said. They didn’t attend Glenn’s or Adams-Kinard’s appearances in district court this week. 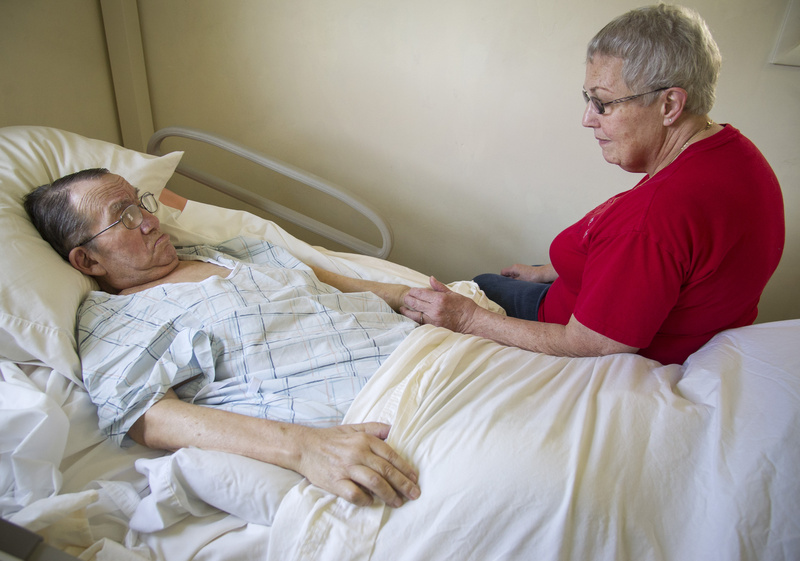 It was too difficult with Bill in the hospital, and his wife said they’d rather see the justice system take its course without being involved. But she called allegations by Adams-Kinard that her father-in-law was a crack cocaine dealer ridiculous. Police found a letter in the apartment where he was hiding with four other teenagers. A previous report indicated there were three teens in the apartment, but a new affidavit filed Thursday said there was one more. All were charged with rendering criminal assistance. The affidavit also included details of the letter apparently penned by Adams-Kinard and addressed to his mother, according to court documents. Adams-Kinard wrote that he and Glenn went to the parking lot where “Shorty” was waiting in his car to pick up an ounce of cocaine from him, but he “tried ripping them off,” the documents say. Adams-Kinard wrote that he and Glenn beat Belton, took his wallet and another ounce of crack from his pockets. Adams-Kinard wrote that he made sure Shorty was breathing before he and Glenn fled. Police said there was no evidence to support the drug-dealing claim. “It sounds like the most outlandish thing in the world that he would be in any part of that,” Bobbie Belton said. Bill Belton agrees, saying he never knew his father to do drugs. “He wouldn’t know crack from sugar,” he said. Claims that Shorty’s death was a racially motivated crime, perpetuated by conservative commentators like Rush Limbaugh, are also unfounded, Bobbie Belton said. “They committed a crime and hopefully they will do their time,” she said. Today’s funeral service begins at noon at Greenwood Memorial Terrace, 211 N. Government Way. On Friday the family will host a smaller, more intimate ceremony at North Hill Christian Church. The service will begin at 2 p.m. at 4620 N. Post St. Bill Belton plans to attend Friday’s service. Both services will be open to the public.